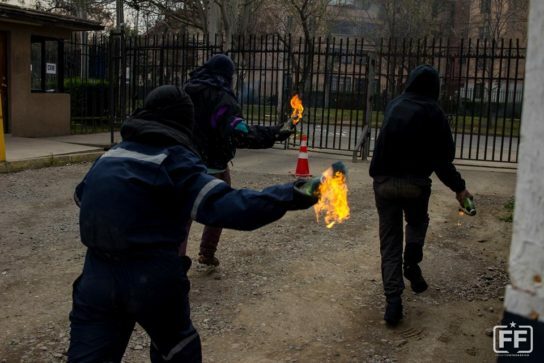 Encapuchadxs (hooded ones) raised barricades and clashed with FF.EE (Carabineros Special Forces) in the vicinity of the University of Chile (FASCO) in commemoration of the murdered and disappeared during the civil-military dictatorship. Today we do not simply commemorate our fallen from the dictatorship, we also claim their forms of struggle and organization that serve as an example of subversion against capital, the state and its repressive apparatus. 44 years on from the harshest episode in our history, we rise as the children and grandchildren of those who were persecuted and killed during the dictatorship. With their same conviction, we promise to never forget their actions, which will live on in the rebellious and combative memory of every revolutionary. From Arde Moyano Records. Revolutionary greetings to all comrades in Chile. This article is necessary to understand this: “Algunas reflexiones sobre el 11 de Septiembre”…These articles are a contribution towards a “proletarian understanding of the germinal Chilean revolutionary process developed in the years ’60 – ’70 and bloodily cut short by the military coup of September 11th 1973; These are, mainly, the role of the left wing of the capitol in the UP [Popular Unity, the leftist party that backed Salvador Allende] and later fighting against the dictatorship, developing the self-activity of the proletariat, criticizing the democracy and necessity of a radical rupture with the reproduction of capitalism in every sphere, connected to the present struggles whose efforts have fought from below against thugs of the state and military regime (of whom the governing clique of today is a direct successor), suffering in many cases torture, imprisonment, assassination and disappearance”. This is the “military communiqué” which appeared in a new commemoration, where the previous article helped to understand the process of class war which resulted in the current spectacular capitalism. And perhaps it could be helpful to give class content to expressions of the anger of the streets, understanding them in the totality that is capitalism. 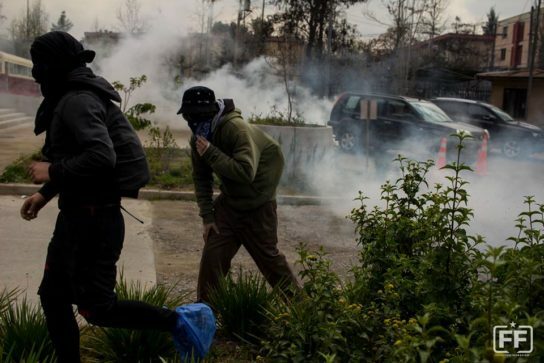 Heavy clashes broke out at the end of the demonstration called for at the central cemetery by human rights organizations, on the 38th commemoration of the last coup. Over 300 encapuchadxs attacked several media, police and special forces snipers and pacos de rojo [red police] in the vicinity of the general cemetery, several mass media groups were targeted as during the previous year, sustaining heavy losses due to the destruction of their equipment. More than 10 police were wounded as well as a mounted police horse. A youth was arrested during clashes in possession of 4 molotov cocktails, perhaps another frame-up by the police? In all, more than 27 were arrested. More than 10,000 people attended the demonstration. More than 450 moments of conflict were reported during the night in Santiago alone: at the end of another September 11th, more the 280,000 people were still effected by the power outages, buses were burned, supermarkets looted and set aflame, churches attacked and nearly burnt. 280 were arrested on the “national” level and 40 cops were wounded (3 seriously). These are just some of the events of day. The night began with fires across Santiago, explosions and barricades in Villa Francia around 9 pm, events that couldn’t be ignored by the special operation of the “authorities” and in other places during the night there were actions such as the attempted arson of a church and two looted supermarkets. In the hills of San Bernardo there were bursts of gunfire, the same as the night before. In Villa Francia alone the police arrested 14 people. Outside the Liceo Dario Salas there were long clashes and in one instance a cop threw tear gas into an apartment. A few short and long distance buses were attacked with stones. Some of the communities in the Metropolitan Region where the 450 conflicts took place were: Maipú (Ciudad Satélite and Camino Rinconada), Recoleta, Huechuraba, Peñalolén, Pudahuel, Lo Espejo, Villa Francia, La Victoria, Gran Avenida, Los Morros, La Pincoya Conchalí, Florida, San Miguel, Macul, Avenida Central, San Ramon and San Bernardo. The unrest spread throughout the night in various parts of the $hilean territory. Concepción: Barricades were built, in particular outside the Vega Monumental and the University of Concepción. There were power outages because of the “cadenazos” [a method of sabotaging power lines or transformers using chains], the press was attacked and a pharmacy was looted. The same situation was reported in Quilpué and Villa Alemana. Valparaiso: Throughout Sunday night, barricades were reported in the area of ​​Playa Ancha Rodelillo, specifically in the area of ​​the University of Playa Ancha, which also had power outages due to cadenazos and several clashes with police and destruction in the city. Arica: About 100 encapuchados started disturbances on Avenida 21 de Mayo, behind the University of Tarapaca, destroying traffic signals within about 5 blocks and intimidating vehicles passing by the place, with no police presence. Valdivia: The commemoration of September 11 began here with a group of people who setting up a barricade in the town of Pablo Neruda, forcing police to clear the area. There were also power outages in the Corvin neighborhood. In turn, Chilectra [Chilean Energy Company] reported that 135,000 customers in the Metropolitan Region partially lost electrical service. Some of the communities effected: Florida, Lo Espejo, Huechuraba, Maipú, Pedro Aguirre Cerda, Estación Central, Conchalí, Pudahuel, San Joaquin, San Miguel, Peñalolén, Lo Prado, San Ramon, Quilicura, Lampa, Independencia, Recoleta and Macul, Puente Alto, La Pintana and San Bernardo. A 15-year-old was hit by a bullet in the chest and seriously injured in the neighborhood of ​​El Bosque. 14 police injured, two seriously injured, one lost an eye (Quilacura) and the other was struck by more than 40 buckshot pellets in the arms and legs (San Bernardo). Other information: The press claims the actions were quieter than in previous years, but apparently that’s all they know to say from a few years back. A police colonel reported that the riots were heavier than last year but just as intense as a few years ago.